ALABAMAWORKS! UPDATE NEWSLETTER - MARCH 2017 - AlabamaWorks! 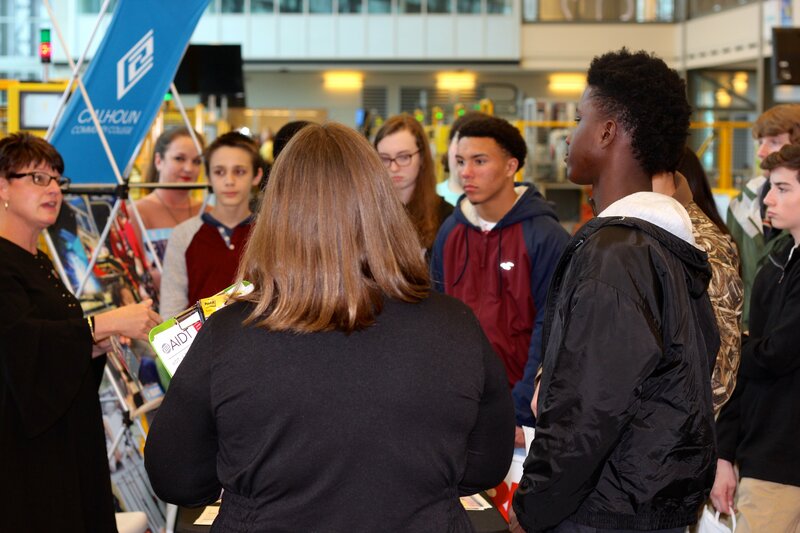 In recognition of Alabama Career and Technical Education Month, the Alabama State Department of Education partnered in February with 14 of the state’s most innovative career technical programs for a special tour. The 2017 Alabama CTE State Tour ran Feb. 10 through Feb. 27 and featured career tech programs throughout the state. Gov. Robert Bentley, who proclaimed February as Alabama CTE Month, was among state leaders who dropped in on tours. After visiting with students at Marshall Technical School, Bentley spoke to local and state officials, school staff and Marshall County Schools leaders, noting that students play a huge role in the state’s economic future. 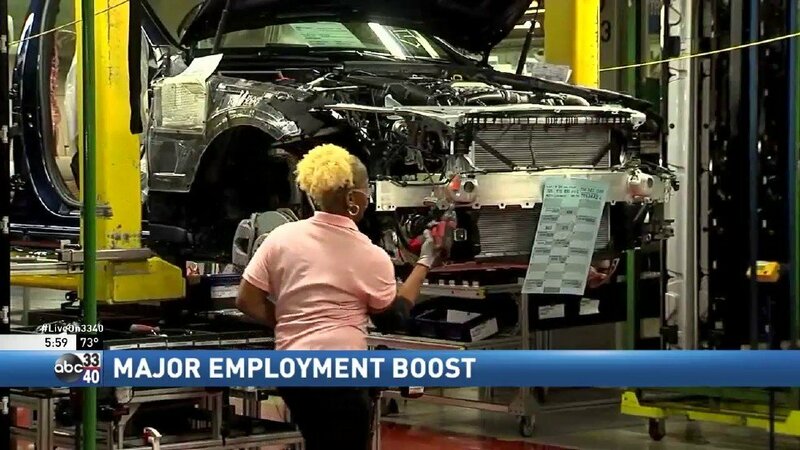 “All of the companies want to make sure that we have a workforce that is capable of helping them make a profit and helping them grow,” Bentley said. Gov. 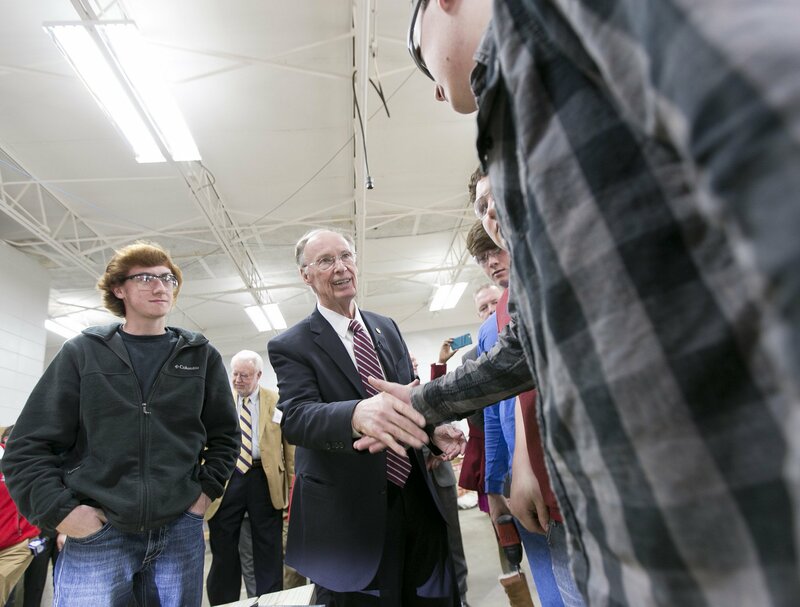 Robert Bentley is greeted by students during tour of Marshall Technical School. Based on the media coverage the tour received, the tour hit a home run. TV stations and newspapers across the state turned out to report on the events in their areas. Please see links to some of the coverage below. In addition to the tours, schools across the state hosted activities like career fairs, college and business tours, job-shadowing days and professional etiquette workshops during Alabama CTE Month to honor the impact CTE is having in preparing students for both academic and workforce success. Among high school graduates entering the workforce, research shows that those with a technical-based background often earn more over a lifetime, according to the ALSDE. aquaculture, sports turf management, human resources, graphic design, public relations, culinary arts, social work, medical professions (physician, nursing and dentistry) and marine technology. To learn more about Alabama CTE, visit www.alsde.edu. February was National Career and Technical Education Month, and the Alabama Robotics Technology Park, the Alabama Community College System and AIDT celebrated with a special day at the Robotics Park on Feb. 27. More than 100 students from North Alabama visited the state-of-the-art robotics and technology training center in Tanner for hands-on opportunities to learn about careers in advanced manufacturing. Students took part in interactive experiences and talked with employers about job opportunities in the technology fields. Students receive information about Calhoun Community College while touring Robotics Technology Park. Following the students’ visit, state Rep. Terri Collins and state Sens. Arthur Orr and Bill Holtzclaw joined education and workforce training leaders at a press conference to discuss the Robotics Technology Park as an asset in providing students the opportunities and tools they need to fill today’s many technology and manufacturing jobs. Other leaders there included Jeff Lynn, senior executive director of workforce and economic development for the Alabama Community College System; Blake McAnally, a member of the Alabama Community College System board of trustees; and Ed Castile, AIDT director and deputy secretary of the Alabama Department of Commerce. The Alabama Community College System recently entered a new partnership with AIDT to allow students across the state to use the Robotics Technology Park. Read more about the Robotics Technology Park’s big day in Athens’ New Courier. To learn more about the Robotics Technology Park, visit its website. The Alabama Department of Labor and its Career Center in Huntsville are gearing up for one of the largest ever job fairs in North Alabama. 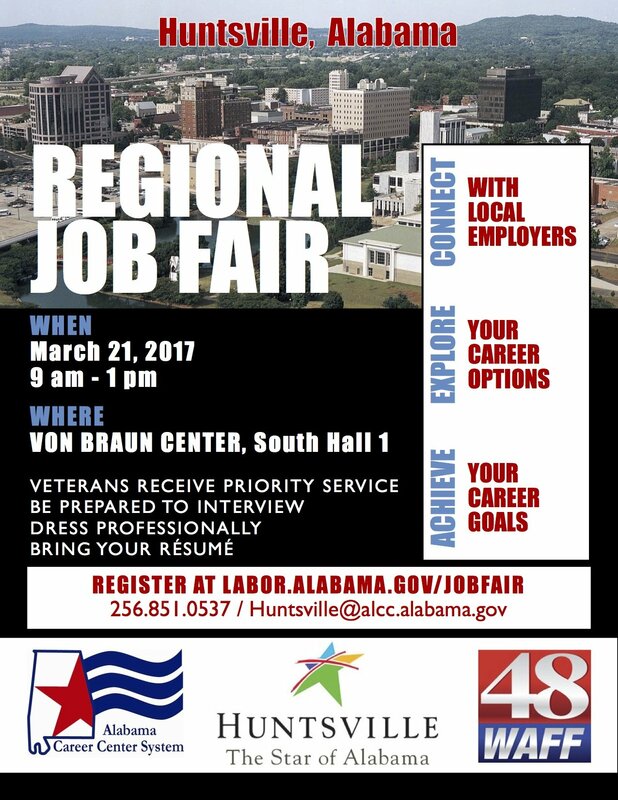 The Huntsville Regional Job Fair will be March 21 at the Von Braun Center. Department of Labor officials are aiming for up to 200 employers to participate. Already, the number of employers has reached 115 with nearly 3,000 jobs available. The job fair will be from 9 a.m. to 1 p.m. in the Von Braun Center’s South Hall 1. U.S. military veterans will receive priority service. ADOL officials urge job applicants to dress professional, bring their resumes and be prepared to interview. Employers and job seekers alike can register at www.labor.alabama.gov/jobfair. In preparation for the job fair, six Alabama Career Centers in North Alabama will hold job readiness workshops. The three- to four-hour classes will focus on interview skills, resume preparation and how to dress for success. Participants will also be given information on various programs that may be available to them (such as educational and vocational training). At the end of the training, participants will be given a certificate that they can take to employers at the job fair. The six participating Alabama Career Centers are in Cullman, Huntsville, Tanner, Rainsville, Sheffield and Albertville. There is limited seating, and registration is required. For more information, go to www.labor.alabama.gov. West AlabamaWorks was awarded a $1.5 million grant in February from the Appalachian Regional Commission for its WAW 2020 Initiative, the goal of which is to provide job training to meet the workforce needs of the growing automotive and advanced manufacturing industries in western Alabama. Tuscaloosa, Fayette, Bibb, Hale and Lamar are the counties served by the initiative. 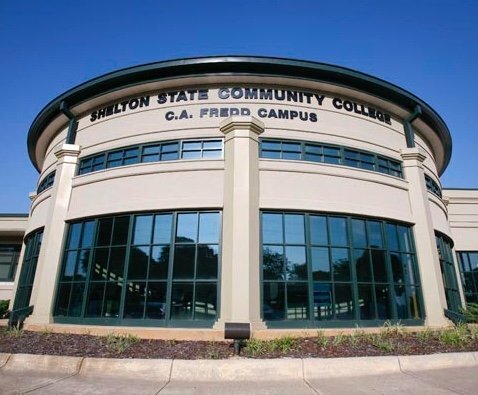 West AlabamaWorks is partnering with Bevill State Community College and Shelton State Community College to develop specific programs based on industry needs. The project will also create a “pop-up” Community Resource Center in Brookwood to serve as a hub for community engagement. The Brookwood Technical High School and Training Center will undergo renovations, allowing the facility to offer credentialing services at four regional high schools for employment in hospitality and culinary arts, health care and advanced manufacturing. 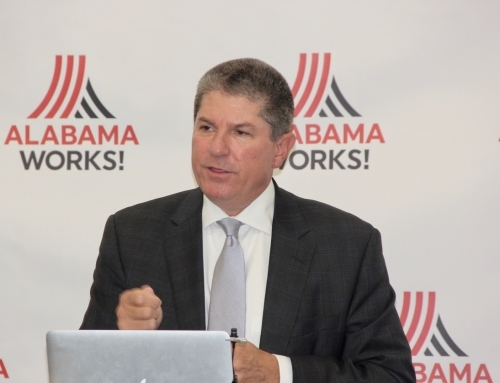 Finally, through a partnership with Energy Alabama and the Alabama Automotive Manufacturers Association, business-specific plans will be developed that will speed the adoption of sustainable energy in Alabama’s automotive industry. The WAW 2020 Initiative will train 1,000 dislocated workers and credential 500 students over the life of the award. 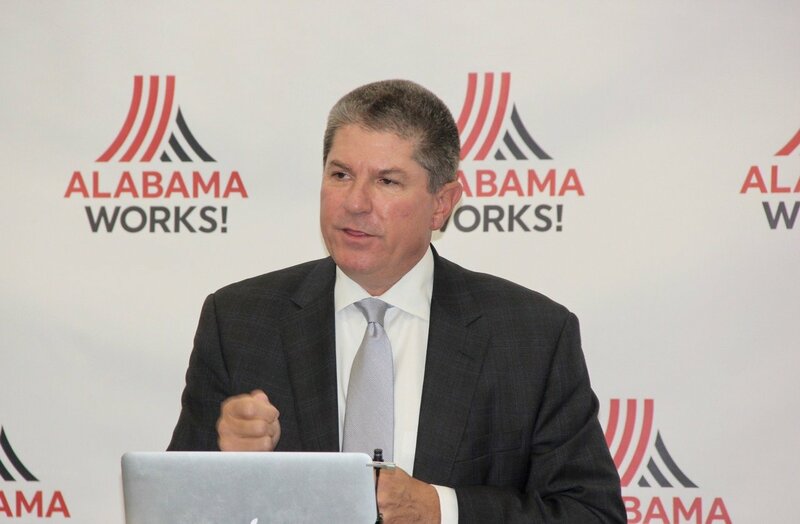 “Not only will this aid workers in an area that has been adversely impacted by the changing economics of the regional coal economy, this project will enable us to fill workforce needs in rapidly advancing sectors,” said Donny Jones, chief operating officer for the Chamber of Commerce of West Alabama and director of West AlabamaWorks. West Alabama also had another recent big announcement. 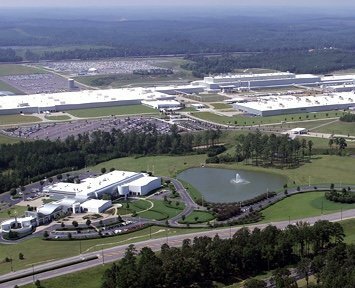 The Chamber of Commerce of West Alabama projected 2,400 automotive jobs will be available in Tuscaloosa County within the next 18 months, created by suppliers for the Mercedes-Benz U.S. International plant in Vance gearing up for Mercedes’ ongoing $1.3 billion expansion. Shelton State Community College in Tuscaloosa is a training provider for the grant, offering credentials in manufacturing and logistics. He said Mercedes suppliers will fill more than 16 different job types, with salaries ranging from $23,000 to $143,000. To view the ABC 33/40 story about the jobs projection, click the image below. Alabama’s workforce system has a great story to tell. Whether it’s partnering with industry to connect employers with job seekers, providing training to today’s workforce or educating future workers, our workforce system is doing more every day to provide opportunities that improve the lives and livelihoods of Alabamians. 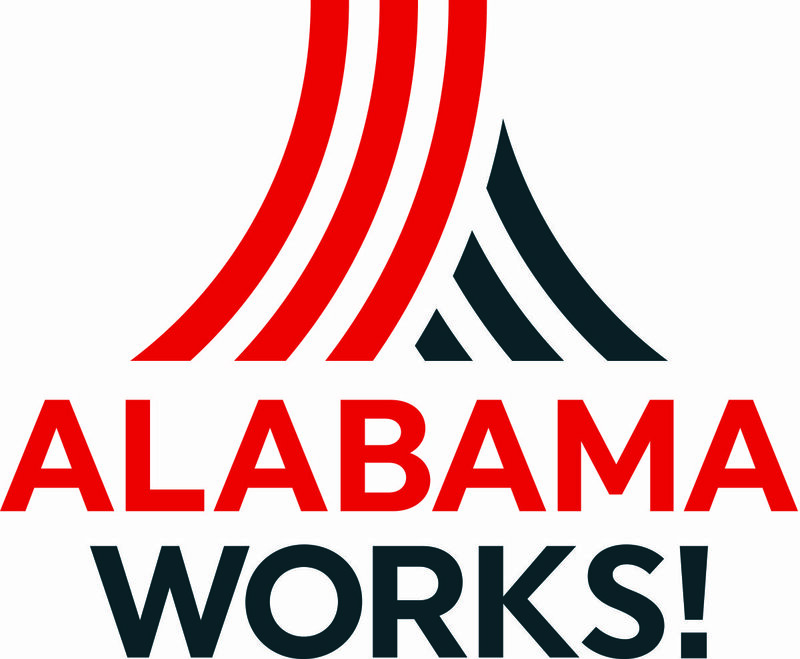 And, of course, the new AlabamaWorks is the catalyst that helps tie it all together. Recently, AlabamaWorks launched an ambitious advertising campaign to better spread the good news about our workforce system, and better inform Alabamians – employers, workers, job seekers and students – of what that system can offer them. Television and radio ads are running on more than 80 stations all across Alabama. Print ads are running in business magazines and in nearly 120 newspapers – dailies and weeklies – from the Tennessee Valley to the Gulf Coast. And digital ads are targeting employers, job seekers and students on the sites they visit on the Internet. These ads promote the AlabamaWorks brand as the vehicle to “recruit, train and empower a highly trained workforce driven by business and industry needs,” and direct the audience to the AlabamaWorks.com website. These initial ads focus on Alabama’s statewide workforce system. Region-specific ads, promoting the local Regional Workforce Councils, will follow in the coming months. To see a sample of the current newspaper ads, click here. To watch a current 30-second TV ad, click here. Southeast AlabamaWorks helped bring more than 5,600 students from three states and more than 80 businesses to the second annual Wiregrass WORKS Career Experience held Feb. 21-23 at the National Peanut Festival Fairgrounds in Dothan. In addition to the career expo for eighth-graders, Wiregrass WORKS also included a Hiring Night for area companies ready to hire. Hiring Night featured more than 30 companies that either had current job openings or jobs that would become available within 90 days. Any job seekers from the community were welcomed. Meanwhile, Career Experience drew eighth-grade students from Barbour, Butler, Coffee, Covington, Crenshaw, Dale, Geneva, Henry, Houston and Pike counties in Alabama, as well as Early, Miller and Seminole counties in Georgia, and Jackson, Holmes and Washington counties in Florida. The students engaged in fun, educational and hands-on experiences that provided them an overview of high-demand, high-wage career opportunities available in the area, while addressing workforce needs in this region. 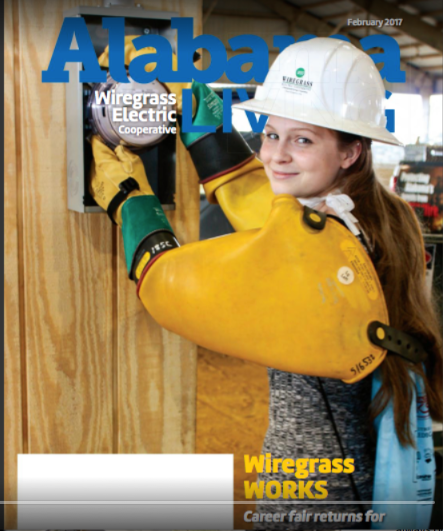 The Wiregrass WORKS Career Experienced was featured on the cover of Alabama Living Magazine. Check it out here. Also, read the Dothan Eagle’s coverage. For more information about Wiregrass Works, visit its website at wiregrassworks.com. For more information about Southeast AlabamaWorks, go to southeastalabamaworks.com. The Oxford Civic Center was home March 7-9 to East AlabamaWorks’ “Worlds of Work.” The career exploration fair drew eighth-graders from six area school systems – Calhoun, Clay, Cleburne, Randolph and Talladega county schools and Gadsden City Schools. The students were presented a variety of career opportunities via hands-on, interactive activities across 10 “career worlds” to help them make smart choices for their future and encourage them to stay in school. The goal is to improve high school graduation rates, develop career interests among students, and promote regional economic development and employment with workforce-ready graduates. The career fair was also open to high school students, parents, school counselors and career coaches. For more information about “Worlds of Work,” visit the East AlabamaWorks website. The Central Six Development Council (Region 4), Girl’s Inc. of Central Alabama, Robins & Morton and AIDT/AWTC are partnering to present “Power UP: It’s a Mother Daughter Thing!” The the second annual event dedicated to educate, engage and encourage girls to explore career opportunities in the construction industry will be held March 21 in Birmingham. According to a 2014 Department of Labor report, more than 9 million people work in the construction industry, yet only 8.9 percent are women. Moreover, of the small segment of women in the industry, the vast majority serve in administrative or clerical positions. Antiqua Cleggett, executive director of Central Six AlabamaWorks, said the event hopes to draw 150 high school girls from Jefferson, Shelby and St. Clair counties. • Educate girls and their mothers on pathways into the construction industry. • Engage girls and their mothers through one-on-one dialogue with women and employers in the construction industry. • Explore the construction industry with hands-on activities that reflect real-world situations. “Power UP: It’s a Mother Daughter Thing!” will be 5:30 to 8:30 p.m. March 21 at the AIDT/Alabama Workforce Training Center in Birmingham. Guidance counselors, career coaches and career and technical education directors from local schools were asked to help identify participants for this event. In addition, the partnership has developed criteria that will ensure participants are diverse in age, ethnicity and socio-economic background. For more information, email Cleggett at acleggett@centralsix.org. Or call 205-719-3239.